One thing I didn't really know about CT before moving here is how it is a sandwich paradise. Chicken cutlets, eggplant, sausage, Italian cold cuts, meatballs, and shaved steak seem to be the mainstays, along with more ordinary deli meats; the older-school-looking places also offer a "pepper and egg" variety, which is entirely new to me, and even veal cutlet! Pulled pork was not something I expected to see given the relative dearth of good BBQ here. Look at this nonsense. All of those places are within a few minutes' drive, and sport similar Italian-leaning menus. 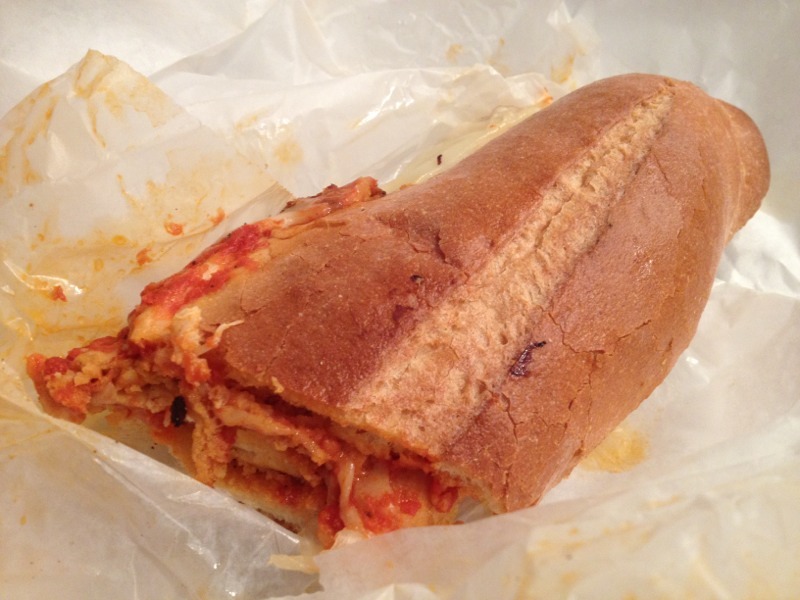 In KC, if I wanted a chicken parmesan sandwich, my closest options were Subway or Quizno's. Here I have enough places with which to start a freaking blog on that one sandwich, if I wanted. Boy, I wish I had options like that here in Milwaukee! Key seems to be the CT grinder rolls. Don't seem to get that quality anywhere else in the US, with some exceptions in NYC & north Jersey area. 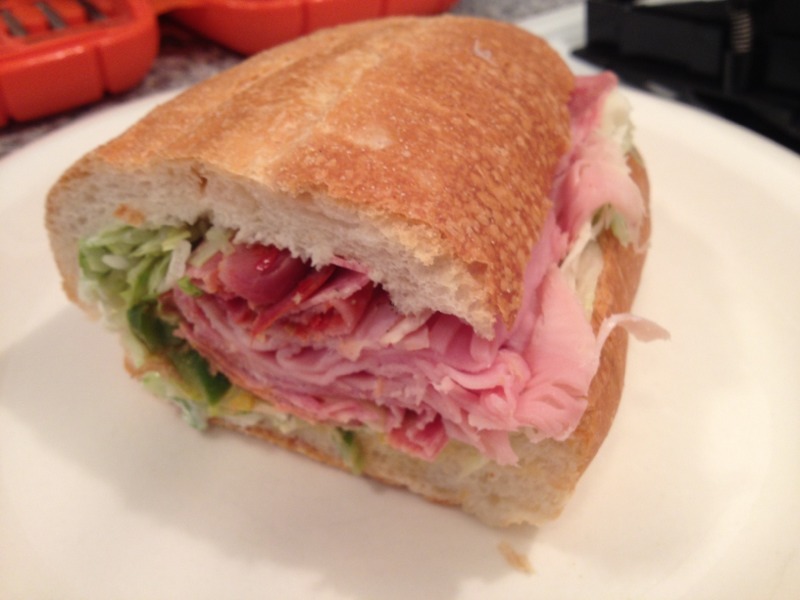 Quality sandwich ingredients are important, but without that classic crusty CT grinder roll, nowhere else comes close. Peppers and eggs -- the real late night snack. Holy cow, where were these places when I was stationed in Groton. Back then there were a few sandwich places and most of the bars served them to the sailors but that menu is a paradise. Sighs........seems to me that a CT specialty coiuld be some form of lobster grinder or Fried clam Grinder........Close to the "Rolls", but with some interesting "adds".. In Guilford we ate at Ballous that has a wonderful menu and and a lousy patio overlooking parking lot....had a Lobster Panini there that was heavenly if sacrosanct! This is an excellent sandwich. It is worth the price (which isn't bad at all). On the same day I had a sandwich and bottled drink here and at Lena's (which is fine, just not great). It cost me exactly the same amount but the sandwich here was at least twice the size of Lena's and it was much tastier. To be completely fair I should have had the same sandwich but Lena's is a different type of place. 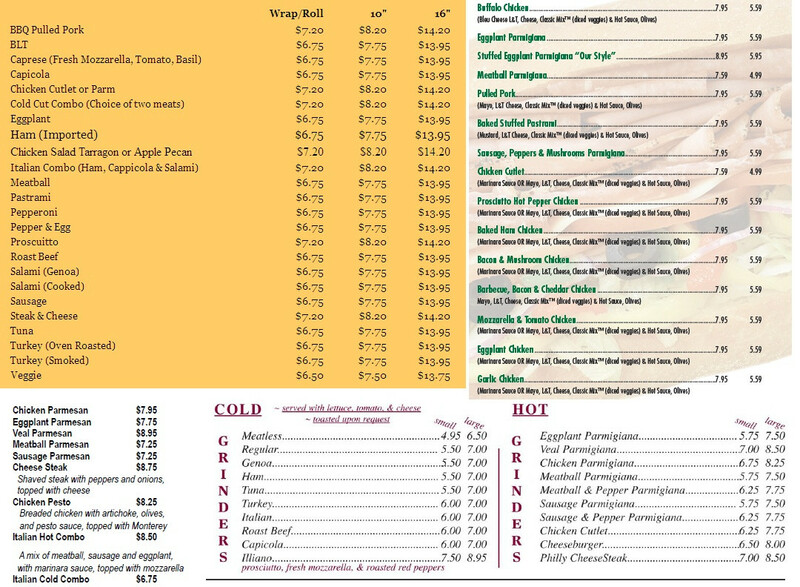 Nardelli's delivers a great sandwich with fast, courteous service and plenty of other options (We Like Cannoli!). 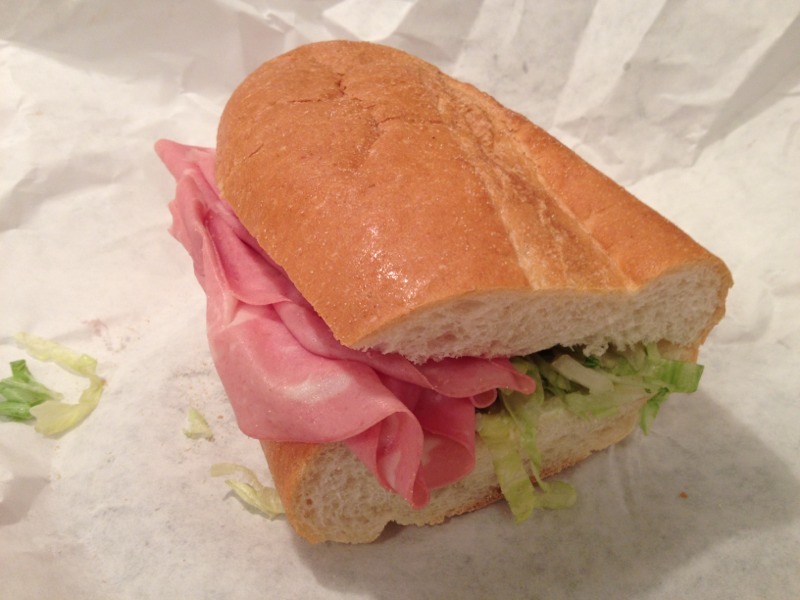 I'm going to try some of the other locations but right now I'm calling Nardelli's one of the top sandwich shops in the state! I'm also vouching for the stuffed pastrami sandwich. Nardelli's has been good to me. I've had their chicken cutlet, shaved steak, meatball, sausage and peppers, mortadella, American combo, Italian combo, capicola, "pruzitini" (prosciuttini I assume), and roast beef, and I've also tried their lasagna. Overall I'd say they do cold grinders better than hot ones, but I've yet to try their eggplant, pulled pork, or stuffed pastrami. Interesting that the pastrami isn't listed by itself as a cold or hot option. I wonder if they'd do that for me. Anyway, I usually eat at the new location in Cromwell, since I live right there on the edge of Middletown. Long time reader but first time poster to RF. One of my family traditions involves grinders. When I was a little girl my family lived near Springfield, MA, but an aunt, uncle, and grandma lived in Westerly, RI, about a 2-hr trip each way. On the way home from visiting, dad would stop at a mom and pop grocery and buy grinders and a big bag of State Line potato chips for an easy supper, when we got home. Everyone enjoyed this--especially mom, since it meant no dishes to wash. Later, after living in Texas and a number of other states--no grinders!--we found ourselves back in MA and dad tried to find a new source for grinders. The mom and pop had long since gone out of business. He asked around and found D'elia's in Norwich, CT, which is near New London in the southeast part of CT. This was circa 1967, dad and mom are now gone, but the family tradition survives. 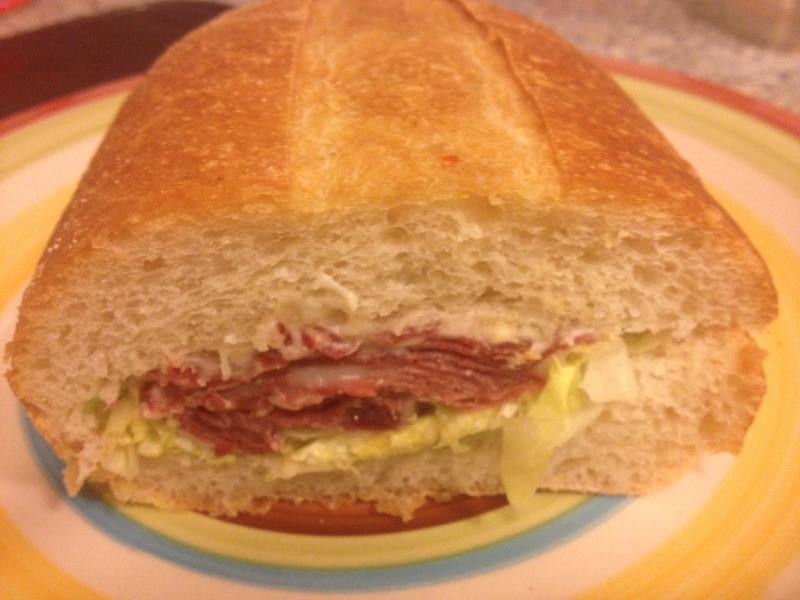 Most recently a niece, nephew, and grandniece came up to Maine, where I now live, and stopped at D'elia's and got cold salami grinders and put them in an ice chest. Yum. These are the same type that I grew up on. On trips south to visit family in southern NJ, I have done the same thing. Bought grinders at D'elia's. They are what I would call a hole-in-the-wall store front, where they bake their own bread. That is what makes a great grinder. 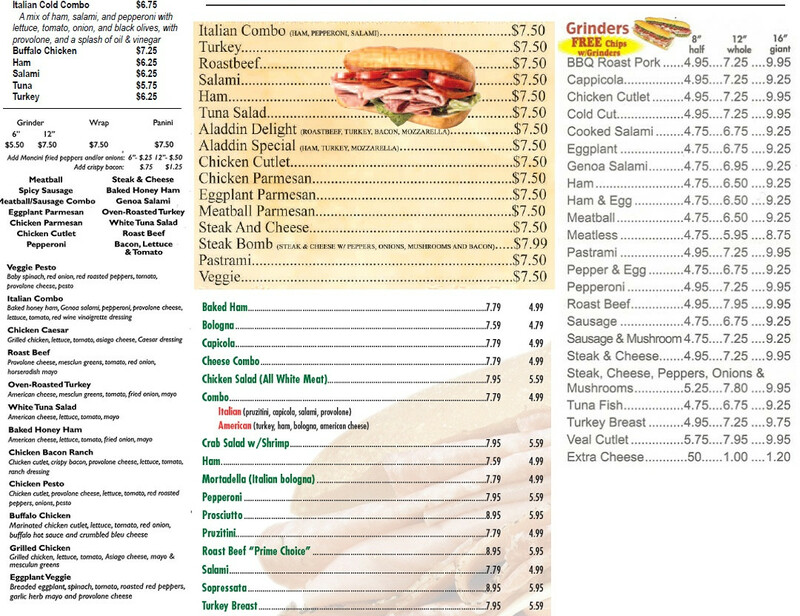 They have lots of different meats to choose from, but the basic cold grinder includes the meat, finely shredded lettuce, thinly sliced tomato and provolone, s&p, and is sprinkled with oil. A wonderful place! Until a few years ago and a younger generation of family took over, two older ladies--one the owner--would always be there and recognize me, though my stops were infrequent. When you order a lot at once, you get remembered. Anyway, this place is highly recommended by me. A few years ago I remember doing an online search and found that another branch of the family had a place in CA, too. Apparently part of the family went west many years ago. Don't know what that D'elia's is like. Welcome to Roadfood as a poster JB-ME. And thanks for the interesting first post. I hope there'll be many more. But, darn, you've made me hungry. Thanks, Michael. I've enjoyed you and your DW's posts over the years. Sorry I made you hungry--or maybe I'm not sorry! Describing their wonderful grinders was the point. If it is any consolation, it makes me hungry, too, and I had one just last weekend with the family mentioned. Of course, we also had crab rolls and lobster rolls, too. New England style--not CT style--and on grilled NE style hotdog buns. When I make crab or lobster rolls at home, I use Hellman's light mayo and barely enough to hold it together and nothing else like lettuce or celery. I want to taste the shellfish--not the mayo or other filler. I know the different styles (NE vs CT) have been discussed on RF. I don't think there is a right or wrong way--it is all personal preference and taste or what you grew up enjoying. Same argument exists between NE vs Manhattan style clam chowder. In Maine they have something similar to grinders called Italians, which are okay, but have no lettuce (unless ordered extra) and are meat, cheese, sliced green pepper, onion, tomato, and oil. And those rolls would be.................?????????? A Barrel Grinder is its own special kind of food. The recipe for ANY Barrel Grinder can be broken down thus: Take a Kaiser roll or other stocky round roll, cut a plug out of the top to make it into a ``barrel,'' fill it with some sort of filling, put a slice of cheese on for a lid, and bake it. That's a Barrel Grinder. But I haven't found references to barrel grinders anywhere else. Is this a grinder variation that one could reliably find, or is the author of this article describing something very rare? Excellent first post JB-ME. Welcome to Roadfood and we hope to hear much more from you! Thanks, BB! I enjoy reading your trip reports and those of others, too. I enjoy the mix of food photos and descriptions and local photos--historical or scenery. Ralph Melton--Enjoyed your recent trip report to Texas, especially since my family lived there many years ago. My mother loved springtime and the bluebonnet season. I still have some old slides of those. I've never heard of barrel grinders, which doesn't mean anything. They sound interesting, though. I'd guess that they aren't a very common grinder variation. I might try making them at home sometime. Ketteract's start of this showed pictures of both hot and cold grinders and menus with lots of both on them. Depending on where you live, hot grinders (meaning oven-baked with meats, cheese, and often a sauce) are the most common, versus the cold ones I described. Sometimes you get lucky and have a choice of both! When I went back to Westfield, MA this year the first thing I had was a nice cold cut grinder from the Granville (MA) Country Store. Oh Lord! Everything but mayo. I don't know why anyone would go to Subway up that way. The locals are cheaper and much better. And JB-ME is right. Gotta have some State Lines alongside. Oh, and about State Line chips - I saw a bag of those in a Krauszer's recently. Haven't tried them yet. Wasn't there some drama about the company shutting down and then re-emerging with a product that wasn't the same? Am I misinformed? About State Line chips. I haven't seen them in a long time, but I haven't lived where they are normally sold in a long time. I think the company has been sold and the chips are now made in Canada--last I heard. I don't know how they are now. The chips I wrote about were when from when the company was located on the MA-CT line and later when they were headquartered in Wilbraham on Rt 20. I know the older lady (who was in her 90s and still working when I last saw her some years ago now) would have been able to speak Italian to anyone who walked in. I am not sure whether she was an immigrant or the daughter of one, but she had an accent. She was a petite delight to see and always had a smile on her face and a warm welcome for her customers. The way we are treated in a place--as well as the food--determines whether or not we return. I was in heaven when I moved to Hartford and discovered the grinders here. I've eaten at Franklin Giant Grinder and Maple Giant Grinder hundreds of times. (hit each last week) I prefer the peppers to the diced veggie mix at Nardelli's. Lately I've enjoyed the chewier roll at LaRosa. Out of town I love http://www.avventuradeli.com/ and a special mention for Iuliano's in Manchester. Its only open a few days a week now but their pre-made genoa grinders are the best. Fresh baked rolls, sharp provolone and home cured peppers. Yeah, we've had both Franklin and Maple delivered to the office. Opinions are split among my coworkers, although there seems to be a general consensus that Franklin isn't quite as good as it was decades ago. I have no way of knowing, of course! Yelp reviews seem to attack the place's ambience more than its actual product. One thing Maple offers is a "fried mozzarella" grinder that I am very interested in but haven't had yet. If it means just fried cheese in a grinder roll, then I am all for that. There's more meat in there than the pic implies - it gets much thicker in the middle - but it's still a different beast of course from Katz's or Carnegie. Plus it came with mandatory cheese, and I would have opted to omit that. I had it with Boetje's mustard from Rock Island, IL, an old favorite of mine. Again, more meat than you'd think, but this time no cheese if you don't want it! Had it with some giardiniera I'd saved from a trip to Chicago.